Glaston was approached by a large plastics company that serves many sectors nationwide, with a brief to reduce energy costs through a new compressed air system. The company specialises in high-performance fluoropolymer and “ceramic” nonstick coatings that are used for many varied applications. This includes food contact for cookware, bakeware and small electricals, decorative, high temperature applications, industrial applications, aerospace, automotive, chemical processing and textiles. The business had been experiencing higher than acceptable energy costs due to compressed air being generated by two compressors at peak demands. Glaston was approached by the company with a request to supply a single air compressor that would generate the factory air and reduce energy costs. The challenge was to replace the existing HPC compressors with a more cost-effective HPC package, due to the demand increasing from when the compressors were first installed. Specific power (7.32 kW/M3min) is the key figure when assessing compressor efficiency. It represents the total power consumed to generate compressed air, divided by the compressor output FAD. The total maximum power being consumed when both compressors are running is 39.7 kw, the maximum air produced is 14.4 M3/min. The above would have to be considered when putting together a proposal for a new compressed air system. 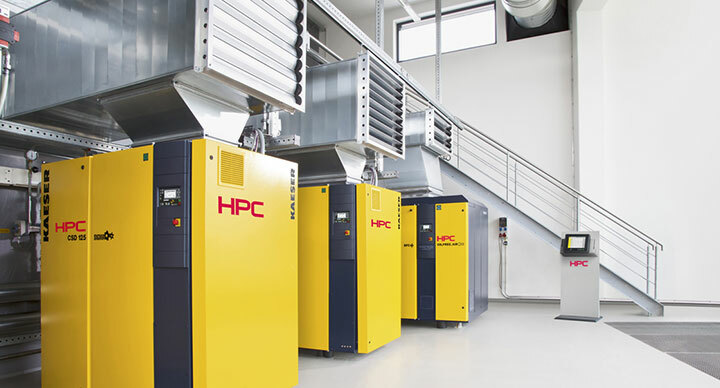 The existing air compressor system featured two HPC screw compressors that generated compressed air for general factory use. Compressed air was held in a “Dry” air receiver, after being treated by one refrigeration dryer and inline filters to ISO.BS8573.class 2.4.2. Air was then distributed via a ring main. The fixed speed compressor in the system runs mainly at night. To comply with the same principles, Glaston replaced the two current compressors with a new HPC Sigma frequency controlled air compressor. The proposed compressor will not run at more than 60% capacity. This will offer the business a spare capacity for future expansion of 40% (2.49 m3/min). Glaston estimates a total saving of around £30k for the business over four years.